I recommended the water changes because that's what I did in my situation. Granted, it was a much different situation than what @Abhijit is going through. I had a lot of rock that had previously been alive, but was dry for a few years. So when I started curing it in my tank, there was no shortage of ammonia source. Lots of dried-out dead stuff. I had to change the water frequently because the odor would build up quickly. So yeah, it appears I was wrong in the advice I gave in this situation. Not to worry. It really won't harm anything doing a waterchange on the tank. In some cases it's necessary and others not so much. @Clown79. Thanks for your advise. I will let the tank cycle as is now. Won't dose with anything but stability for another week. No WC till I reach 0 ammonia and 0 nitrites. Let's see how that goes. I use Prime because my LFS told me to, even though I'm using RODI water from my water purifier. It sort of did surprise me as well, but since the guy who works there asked me to, I did! Guess he just wanted to sell the product. I'll stop using the product. @Firefish15, it's all good bro. We all make mistakes and that's how we learn. That's how this hobby works and that's what makes it so amazing. If you're using tap or cycling with fish, Prime is necessary. It's always good to have it on hand though. I keep a small bottle for emergencies. @Clown79, why can I not use purple up? Does it impact my water chemistry? I thought it's primarily just calcium and alk. Most ppl will advise not to dose anything you aren't testing. It has numerous things in it, including iodine in it which definitely needs testing as it's easy to overdose. If it has alk and ca, it will cause fluctuations in parameters which you definitely don't want with alk. Without heavy stony coral use, these parameters will continue to rise as you dose. Less is more. Keeping things simple is better, especially in the early stages. promotes algae growth and water changes will slow down the cycling process. Since you have dry rock it will take a bit longer. Just be patient . It takes a bit of time. Some people have added a bit of frozen shrimp to their tanks to help speed up the cycling . Since you have﻿ dry rock it will take a bit longer. and I believe the consensus was to not add any ammonia in uncontrolled amounts when you have live rock as it would kill off your live rock. So i think Clowns recommendation is probably the most sound... he just has to do the waiting game now. He could possibly add flakes once in a while in tiny amounts for about a week to get the ammonia to go up a little, but other then that, he should not massively introduce a high concentration of it like adding a raw shrimp would. @dling The rock I got had some traces of coraline algae on it & it was moist. So I'm assuming it was 'live'. Even the sand I got was moist and the seller told me it's live sand. Anyhow, I have not done any WC since. I will test my parameters again tomorrow. Let's see where we're at. @Clown79 @dling @Firefish15 @Naekuh - Tested for parameters. Here are my day # 10 parameters. Ammonia seems to be at 0.25ppm, Nitrite between 0 & 0.25ppm, Nitrate at 15ppm i suppose. 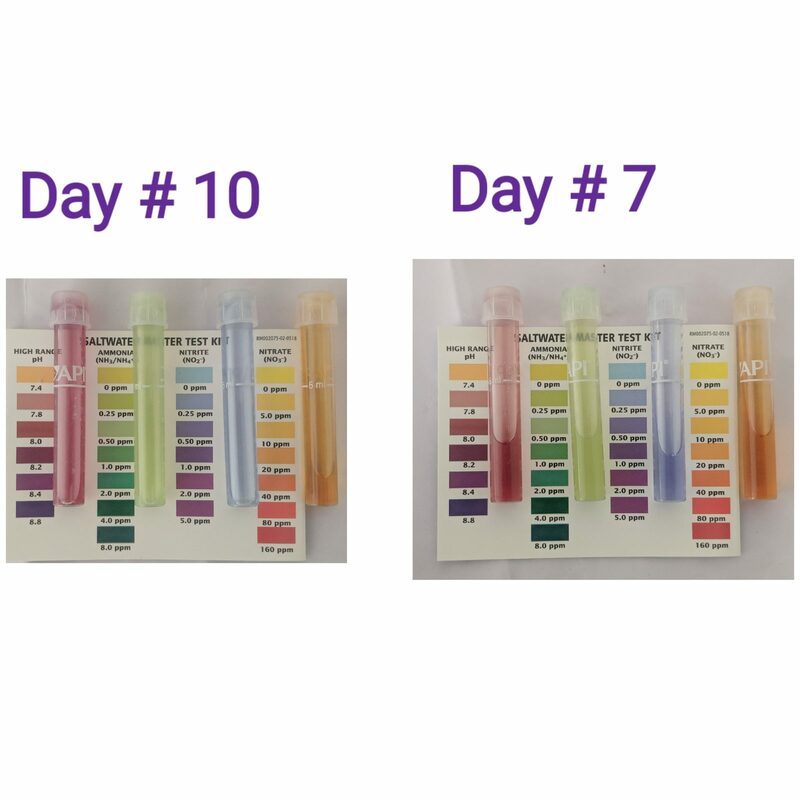 Compared to day #7, looks like my Ammonia is constant, my Nitrites and Nitrates have dipped. Attaching both today's parameters and a comparison. That looks a bit more like .5 and not .25.
i could never get API test kit to report lower then .25 until my tank matured out a bit. It was seriously stuck at .25 for the longest time. I would wait until it shows .25 ammonia, and then give it one more week for safe keeping. Then you can probably do a small water change and drop in a fish. Just note fish order according to everyone is very important. So you most likely want to plan what fish you exactly want, and drop them in order of most peaceful -> bully. And even then sometimes that wont save you, so make sure you get lots of advice on husbandry and what you can add. Also make sure you ask everyone and do lots of research and don't trust your fish store only. They want you to buy, but people on the forums and research want you to keep. Looks like there is still ammonia. Give it time. 10days is not that long. I personally have never had an issue with the api kits. When 0 ammonia has been present it has been yellow. i never had issues either on fresh water until i went over to salt water. Then again on fresh water the solution is also clear like yellow water, and not hazey. Then i googled a lot and ran into @seabassthread where the sensitivity on it is just too extreme, that it may report false positives on a new tank and not a matured out tank. Maybe he can come in and shine some more info, as i found that thread quite interesting. It's a common issue many have run into while others don't. 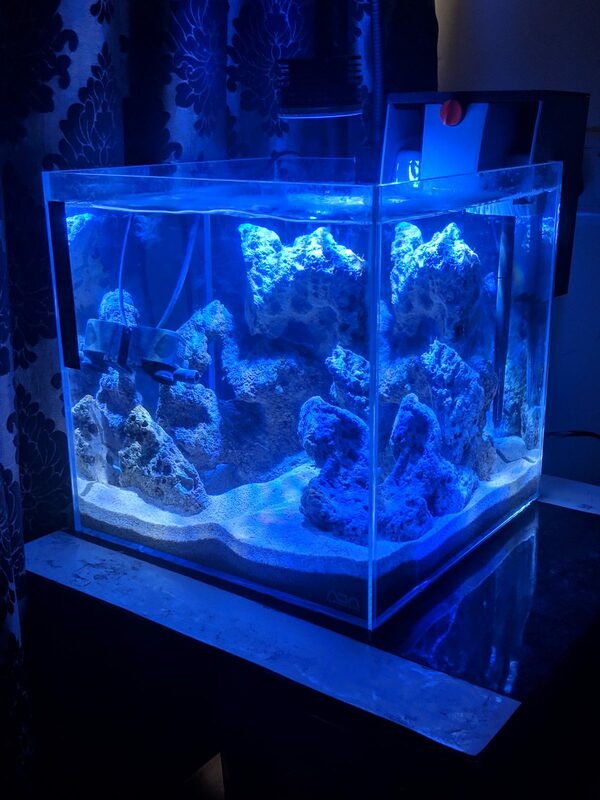 I have not gotten false positives and after cycling all my tanks readings have been yellow. Then﻿ i googled a lot and ran into @seabassthread where the sensi﻿tivity on it is just too extreme, that it may report false po﻿sitives on a new tank and not a m﻿atured out tank. About API Ammonia kit sensitivity, yes, I believe they are more sensitive than some other kits. However, I wouldn't exactly call the readings false positives. I believe they actually show a real presence of ammonia. Is a small amount of ammonia lethal to most marine life? Not always. In fact, the ocean will contain various, small amounts of ammonia (although generally under 0.1 ppm). Levels as low as 0.2 ppm can be harmful to fish (with some fish being more hardy than others). API (like most reagent kits) test total ammonia (free ammonia plus ammonium). Free ammonia enters a fish's blood more easily than ammonium. And pH affects the ratio of ammonia to ammonium. The lower th pH, the less free ammonia (which is the more toxic form). Seachem Prime, and other detoxifiers, temporarily convert free ammonia to ammonium. They don't actually get rid of it. However, in its ammonium state, the biofilter can still process it into nitrite (and then to nitrate). So what about API's Ammonia kits? My feeling is that they show a slight color change with the presence of slight amounts of ammonia (which I can actually demonstrate). However, a slight color change doesn't necessarily equate to a 0.25 ppm reading, even though the first increment is 0.25 ppm. Some people (I think most people) struggle a little with color chart comparisons. Lighting can affect how we see things (for example, our tanks don't typically look as blue to us in person as our camera phones see them). Plus test results aren't always an exact match of any of the colors on a chart, and the colors on some charts aren't always remarkably different. New tanks often contain more trace amounts of ammonia, which can linger on for several weeks. Most people expect those levels to quickly drop to zero; however, that's not really how it works. Mature reef tanks usually closely match API's 0 ppm color (even though there are small amounts of ammonia present). I've done so many of these tests that can see elevated levels without even looking at a chart. I actually find API to be very consistent and provide a good heads up as to the presence at ammonia. People interpret any positive reading when livestock appears fine, as proof of a false positive. However, this often just indicates a small presence of ammonia which isn't enough to cause our livestock visible signs of distress. Like I said, the ocean will even have trace amounts of ammonia. I wish that API would include a 0.1 ppm color match. That might alleviate some of the confusion. @Naekuh, that's good advise. I don't plan to keep a lot of livestock. 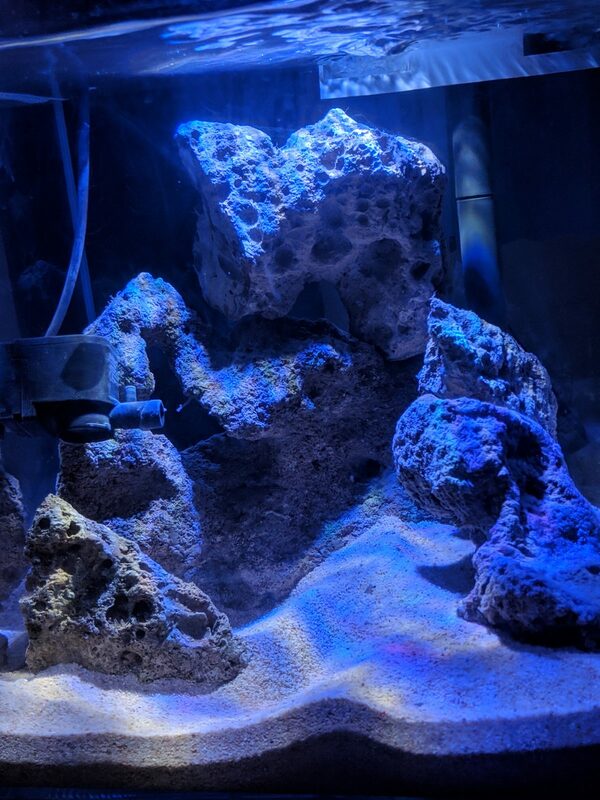 I want to start with some invertebrates, specifically 3 turbo snails - 2 cleaner shrimps - 1 purple firefish goby - 1 percula clown (hopefully, though I'm not sure if I can, considering my tank is exactly 7.28g). Exactly in that order. If I can't add the clown, then I'll go with a tailspot blenny. I'll need some advise on whether I can add a percula (I want one badly). I plan to add the livestock in the order I mentioned every 2 weeks after my readings are good. I'll then add a bubbletip anemone, and then proceed to add soft corals and then maybe a LPS (if I get it and it's legal). @Clown79, When I switched from FW to SW, I knew it's gonna take a lot more patience, so I was prepared. I had accounted for 6-8 weeks of cycling time, which is why I was a little shocked when the readings started showing less ammonia so fast. I'll wait some more and continue taking regular readings every 3-4 days or so. @seabass, that's some extremely detailed and precise information. Thanks for that. It'll be interesting to carry API test kit the next time I go scuba diving and actually get some samples from the reef 'spots' and test them. I'm gonna keep that in mind and see how API tests actual seawater where reefs are thriving. I have vacay coming up next year, hopefully my wife will agree to a reef destination 😬 Anyhow, what'll be your advise at this point? Throw in the livestock once the readings show 0.25ppm? Or wait till it actually shows 0? It would be interesting to see if you could notice any color change in reef samples; although I highly doubt that you'll see anything near a living wild reef (as it should be very low). Anyhow, what'll be your advise at this point? Throw in the livestock once the readings show 0.25ppm? Or wait till it actually shows 0? I don't think it will be necessary to wait until it reads 0. However, I'd give it at least a couple of weeks after it it becomes 0.25 ppm. It should look more yellow than green, even though you might not get an exact 0 ppm match. You can't really wait too long, but you can rush things; try to be patient. @seabass, interesting read. I'll update this forum after my readings are 0.25ppm and then wait for a few weeks after. At this point, its basically just a waiting game. And I'm okay with that. I want to get it right as much as I can, though some things will go wrong. Guys, here are my day # 16 parameters. Ammonia is under 0.25ppm, but not 0. Nitrites are at clear 0. Nitrates seem to be at 10-15ppm. 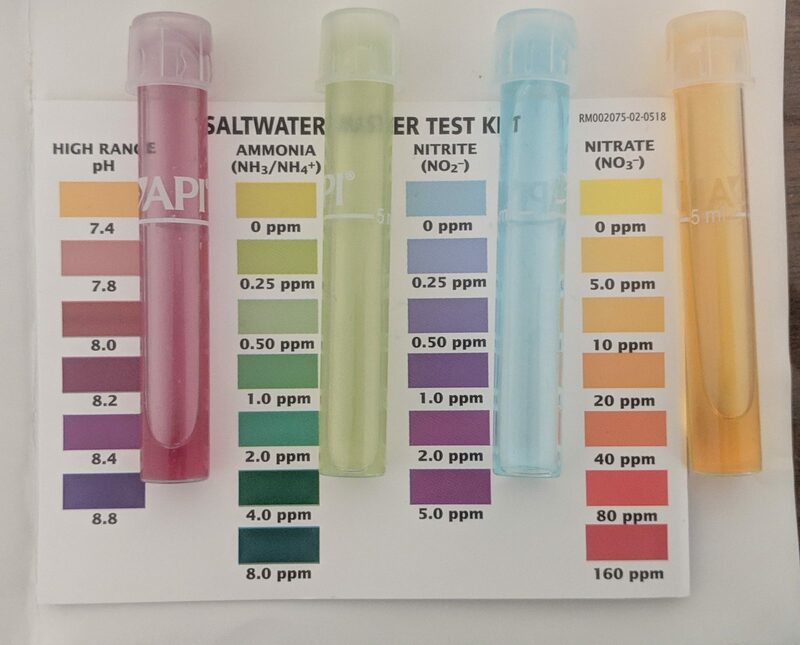 Considering API tests for ammonia aren't absolutely accurate, and considering my Nitrites are 0, should I consider my tank fully cycled? What should I do at this point? I read somewhere that I should add some fish pellets and wait for 12 hours to check whether my ammonia spikes up or does my filtration handle the bioload. Is that a true statement? id honestly say your good to go because the nitrite is 0. That means your bacteria is converting ammonia to nitrite, and you go another set of bacteria converting nitrite to nitrate, and you have no plants to consume the nitrate. How is your tank? has it browned out? IT should brown out a bit, and then go green. Your tank is making good progress. Since the ammonia levels are dropping, this means the bacteria are utilizing more ammonia than what is being produced. At this point you can do a large water change to export the nitrate. A side benefit is that it will also export ammonia. If it were me, I'd change 100%. 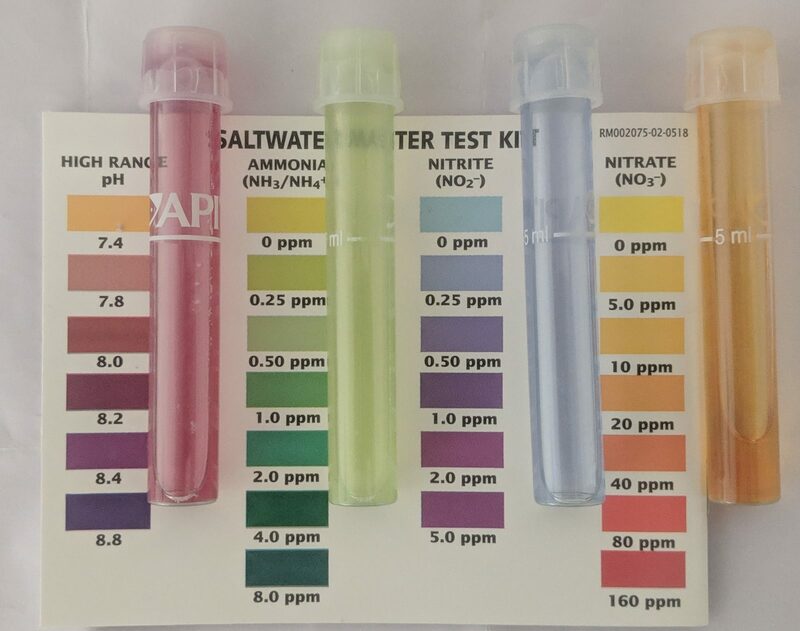 Nitrite isn't toxic at marine pH levels, but it's encouraging that your biofilter is working. At this point, you'll find that your nitrite test won't be needed until you cycle another tank. Is the cycle established? Basically, but there is obviously still some traces of ammonia. I probably wouldn't be comfortable just yet about adding livestock. However, after you change out all the water, it should be looking better. Keep in mind, that newly mixed salt often contains ammonia too (it's a common, yet not often discussed contaminate). After the water change, I'd wait at least a week. Report back your test results in a week. I'll bet you'll be ready then. @Naekuh, surprisingly I don't have any algae, brown or otherwise. My tank is clean!! Here are a couple of pictures. The nitrifying bacteria will be fine for many months without ammonia; so no worries there. Plus, it resides mostly on hard surfaces (rock, sand, walls, and equipment), so the water change won't export it either. did you kill all your lights during your cycle? Im fairly sure most tanks will brown out, unless you ran it in the dark. @seabass, okay that's a relief then!! Super!! Thanks for your advise, I'll report back in a week. @Naekuh, I did put on my lights, but not as much.. couple of hours everyday, not the required 8-9 hours each day. @seabass is it possible for a tank to completely bypass the diatom explosion during cycle in a salt water tank? If this was freshwater, id be worried and think something was wrong... in all my tanks i have ever done, it always goes brown then it will start to go green, and that's when you know your cycle is fully complete outside checking ammonia.. I think that was how my SW tank now even underwent. It's true that a diatom bloom usually occurs around this time (especially when using new sand). However, it doesn't always happen. Lack of silicate can prevent a diatom bloom. Also, the reduction light cycle can be delaying the bloom. And yes, green algae blooms often follow diatoms (depending on nutrient levels). I usually don't like adding coral until after these blooms. @Abhijit, I would increase your light cycle (to normal times) during this week. We might as well see if anything blooms. This might also provide some food for a cleanup crew (when you are ready to add them).